Gibson Dunn | Waldmann, Frances A.
Frances Waldmann is a litigation associate in the Los Angeles office of Gibson, Dunn & Crutcher. Her practice focuses on white-collar criminal defense and antitrust matters, including litigation, internal investigations, and regulatory enforcement. As a native German speaker, she has particular experience of transnational investigations by U.K., U.S. and German regulators, and internal investigations connected thereto. In addition, she regularly represents clients in complex domestic and international litigation and arbitration as well as data privacy matters. 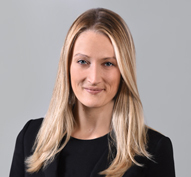 Ms. Waldmann practiced in Gibson Dunn’s London office from 2014 to 2016, and, prior to joining Gibson Dunn, at a leading set of barristers’ chambers in London. Called to the bar in 2010, she both prosecuted and defended cases as sole or junior advocate in a variety of courts of first instance and appellate courts, specializing in matters related to complex criminal and civil fraud and corporate crime. Ms. Waldmann is admitted to practice in the State of California. Languages: English, German (native) and French (working knowledge).